Taco and I flew on into OPSB. No pics, but lots of fog and another bare airfield. At least this one was paved. No causalities, incidents or accidents, so a great flight all around. The attached picture show the fog as we neared the mountains at in the area of around 9 to 10,000 feet, as we cleared the mountain ridge the fog was hiding a lot of the local foothills, and let me tell yea you couldn't see the darn things. A little spooky descended into that mess, but our luck held for us, hehe and the fog cleared over the lower hills right after I started dropping down to around 4000 feet. We still had a lot of valley fog and finding the airport became a little tricky! As we got closer to the bloody runway it popped right out of the fog, and we both made a good landing. Shoot, no McDonalds and as Willy mention upon parking, hehe no snow cone available, and nobody shooting at us yet. Surprise! hehe, here we are again. Yesterday's flight was very good with the exception of the fog and boy, was there some fog. Come to think about the fog it was with us for the whole bloody flight. We left Sibi OPSB with 3/4 miles of visibly, which in my case was completely wrong, and sowe headed for Miram Shah OPMN thru this India type fog.. Over some of high mountains, and flying at 10,500 feet, it was so foggy that had a heck of a time just seeing the Mossie wing tips, and we had the lights on. Like Willy said we were playing dodge the rock thru the whole flight. As we started down thru this here soup it could get a little touchy, by not being able to see and trying to miss those lower lying mountain rocks. But we made it to the general area of the airport and thru the fog we seen the runways, and then bounced down on the airport runway like we knew what the heck we were doing hehe. Next flight will be from OPMN to OPCH (Chitral) all still in Pakistan, lol, with the fog! We really need to talk to our travel agent about this fog stuff. We didn't get anywhere yesterday. Moses03 and srgalahad were still out in town somewhere's and Taco's Mossie was having rudder problems. I got another Twin Beech at the Swap N Shop, but needed to go through a few systems on it before heading out. Not that that's ever stopped me before. Come on feet start moving, and lets get out of here. Hehe, Whoa! didn't realize Willy was that close. Skirted the high terrain into the far northern reaches of Pakistan. I think we found the high road. Going to see if we can scare up a turkey in far western China. Well, I missed the jet flight over those over grown hills, But caught up with the flight at ZWTN in the Mossie. The plan for the next flight was ZWTN to VI66 over some big and I mean big and high mountains. As mention by one of the pilots was that look like the mountains and roads were climbing up with us as we were climbing up to around 22,000 feet. After Dudley and I got to altitude in some places we were only a few hundred feet above the top of these buggers. Hot dog, we had a nice long runway 9000 feet of gravel, and hehe, the Airport set at 13,700 feet. We all made it down OK, but, I believe, Willy had a little problem with on the landing gears on his plane. Surprising, it was a neat flight and nice. Oops! Forgot to add one picture. my bad. Moses and Dudley and I took off from VI66 (Fukche0 and headed to VIDF (Pithorgarh) Both in India. Our flying buddy, Willy was still having problems with one of his plane's landing gear, so he missed our departure, and will catch up with us at ViDF. The recommended altitude was 31,500 feet. 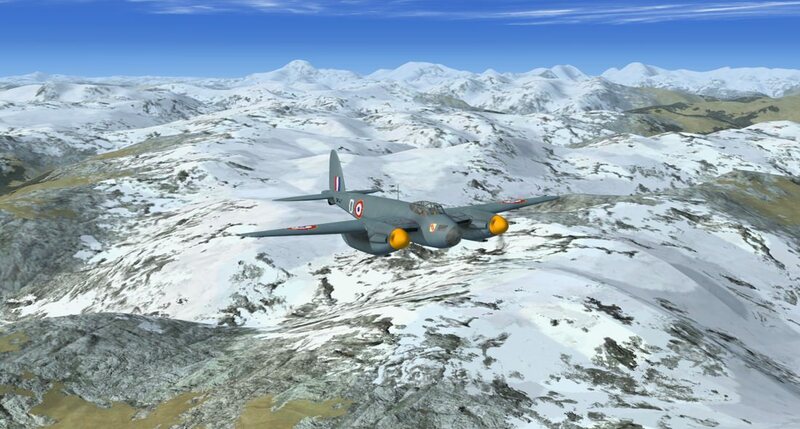 I flew along at 30,000 and thought that some of these mountain peaks would be popping thru the bottom of our Mossie, hehe but we made it over these peaks (note attached picture). The next flight we will be leaving VIDF (India) and hopefully, headed for VNPK (Pokhara, Nepal). We will talk to you after we arrive. While we were doing some R&R, I decided to do some checking for a new ride on our next adventure, so deiced to check out a few of the local airports. Well, guess what I found at the Mojave airport. hehe I climbed aboard and the local folks caught me and ask me, and being very polite, told me to get me bun off of the plane. hehe, oh shucks, just one of those days I guess. To whale or not to whale? In the foothills of the Himalayas at Pokhara, Nepal. Fred came into the pilot's lounge at VNPK fussing about how the galley oven in the Grizzly didn't work and he couldn't fix him a chili cheese corn dog. So, I gave him the company credit card and told him to go over to the Swap n Shop to see what he could find. He came back with a new oven alright. With a RB-50 wrapped around it. You'd think he'd have let 'em finish painting it black before having it delivered. Fred doesn't get to use the credit card anymore. You didn't get a company credit card? Look in the top left pocket of the company issued pink flight suit. As you may have noticed that Willy had some problems with his plane, and was unable to leave when Moses and I took off from VIDF (Pithorgarh) to VNPK (Pokhara, Nepal). Hehe, talk about getting high! These mountains that we flew thru seem to grow the farther we flew along. Should have remember that when you get to Nepal now that's where the really big mountains are. 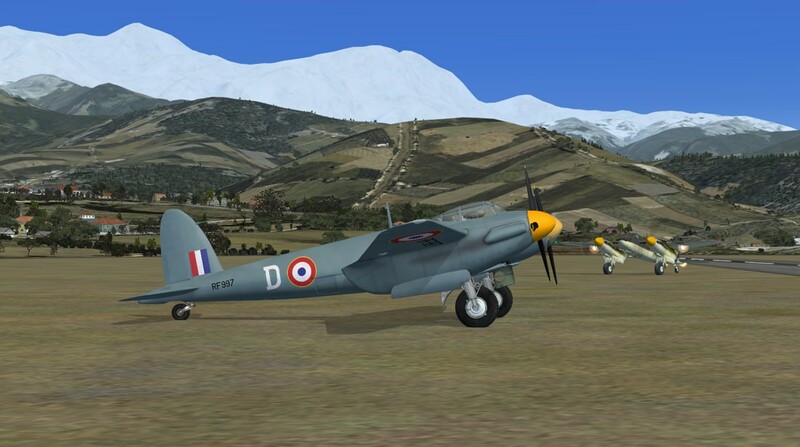 Well, it was a nice flight even when I started to head for the deck, I couldn't slow down quick enough and needed to over fly the airport make a couple of turn to get the Mossies to slow down, got it so slow almost stalled. But I was able to make one of my infamous landings. So long see you later. Back! hehe, thought I would give you all an larger picture of the some of the mountains that we flew over. Hey, Hey, here we are again! Well, this junket High Road To China is almost completed, just one more flight. Here we go, we left Tezpur, India and headed full blast to Xichand, China flying jet aircraft. We flew over some very nasty country, and as Willy mentioned that an helicopter would have a heck of a time trying to fine a place to land. But Wow! it was sure nice to fine that ZUXC was in a fairly large valley with a very long runway, and with nice weather! Hehe, and we found a place where we could get Chinese food take out, and it was sure good. OK, we will be heading to ZUUU Chengdu, China for the final landing of this adventure. So see you all there.